A blue and white ring. Replenishes a wedge of Mario's health meter and awards him a Power Star when he swims through five. The bubble ring, also known as Water Ring or simply ring, is an underwater object appearing in Super Mario 64 and its remake, Super Mario 64 DS. In Super Mario 64 and Super Mario 64 DS, they are seen only in the ninth course, Dire, Dire Docks. When Mario swims through a bubble ring, it will replenish one wedge of his health meter, and a number will appear above Mario. This number represents the amount of bubble rings Mario has passed through. When Mario swims through five bubble rings, he will be granted with a Power Star. Bubble rings were required for Stars 4 and 5 in Dire, Dire Docks. In Star 4, "Through the Jet Stream", Mario must swim to the other side of the tunnel to find a jet stream spraying out bubble rings. After Mario collects five of these bubble rings, a Power Star appears above the jet stream that Metal Mario can collect. In Star 5, "The Manta Ray's Reward", Mario will find a Manta Ray swimming around underwater and leaving a trail of bubble rings. Mario must follow this trail to collect five bubble rings and make the Power Star appear. 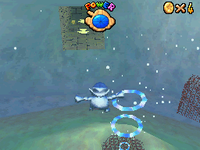 Rings also appear in Mario Party 4 in the minigame Manta Rings, along with a gold type. This page was last edited on March 7, 2019, at 09:10.